It’s great to go beach camping for a weekend in the middle of winter. 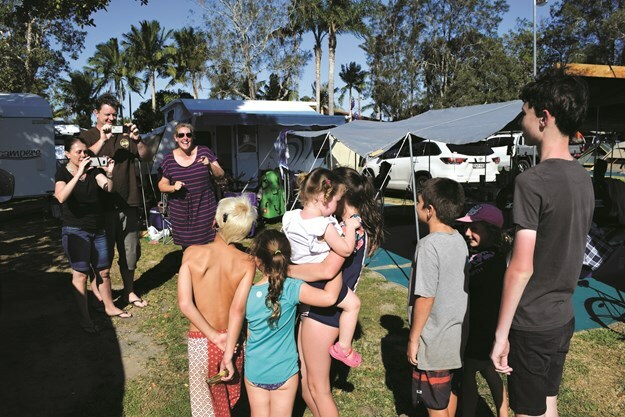 Living inland where temperatures can drop to an eye-watering minus seven degrees, it didn’t take much to persuade our crew to celebrate a best mate’s birthday at a big name holiday park on a south coast town three hours from home. When we arrived, I wasn’t surprised the park was only about 10 per cent full. After all, it was low season. But I was surprised to have our camp robbed by unwelcome visitors as we slept after midnight on Saturday. On a grassy bank overlooking our rigs, a group of youths gathered; six to eight maintained vigil as two crept down and stole an Esky of drinks from outside the door of our mate's camper. They found no beer or alco-pops inside, so they returned to see if they’d have better luck with our camper. Fortunately, my husband Scott has very well-tuned senses. He can sleep through the routine sounds of life (traffic, bird calls, or rain pattering on the roof), but when it comes to human activity, he sleeps ‘with one eye open’ — so he woke immediately to the footsteps on the concrete pad near the van. He was outside in a flash, yelling at the intruders to bugger off in suitably firm language. Disturbed, the two youths scrambled back up the bank and the whole group scurried away into the night. After calling the local police with a description of the offenders, Scott returned to the camper. Overnight he maintained a level of alertness that denied him a restful sleep. Now, this wasn’t the first time we’d experienced theft like this in populated centres. Camping in built-up areas (during holiday periods in particular), we make a habit of increasing precautions against petty crime such as campsite theft. After all, the seasonal increase of transient visitors to popular holiday destinations creates a level of anonymity among people that makes opportunistic stealing much easier. The difference with the recent attempted theft was that it happened in low season. There was hardly anyone around. It was obvious that our night visitors were locals. These were the sons of the people who run the small businesses on which the town’s economy virtually depends. Their parents probably know the friendly staff who made such an effort to make us feel welcome when we arrived at the park. Maybe their family runs the local fuel store or a cafe where visitors spend their money. At the very least, they are the neighbours of people who've chosen this town to 'live the Aussie dream' — a place by the beach. In effect, these youths were undermining the essence of their own town – making it somewhere neither we or our mates will ever stay again, and a place that we'll warn our fellow travellers about. So who’s to blame? Is it the parents for failing to instil appropriate values in these kids and for failing to keep tabs on them after hours? Or is it inevitable? It’s a known fact that the chief perpetrators of youth crime are males between the ages of 18 and 20. Boredom is thought to be a major cause, with youths seeking the thrill of drugs, alcohol and/or theft to offset their persistent sense of tedium. Perhaps the youths who intruded on our camp were simply prime candidates for a study of Boredom Theory and its links to youth criminality (see Newton’s research, Edith Cowen University, 2001). Whatever the answer, the impact of their midnight shenanigans goes well beyond any scientific or pseudo-scientific analysis. To me, the impact is personal. It comes down to the fact that, having been woken by the intrusion, our seven year old daughter has — for the first time ever — become scared of the dark. And there is simply no excuse for that.